I mentioned in the previous post that Orseen the human orc warpriest’s player, Bill, had long wanted to play a lizardfolk. I don’t remember when he started bringing it up at the table – sometime during The Varnhold Vanishing, I think – but I didn’t think much of it at first. He has a lot of unusual ideas, and seems like the kind of player who wants to try out lots of different ideas. At first it was just a, “Oh if Orseen dies for good it’s not a big deal, I already know what I want to play next – a lizardfolk magus!” But it kept coming up, so I let him know in no uncertain terms that he could retire Orseen and we’d find a way to work this character into the story, if that’s what he wanted. He always demurred. He really liked Orseen, he said, and didn’t want to stop playing him. Later we found out Bill had created a whole campaign world that was populated by nothing but the various D&D reptilian humanoid species, and I wondered if maybe this was more than a passing fancy! Getting back to the current session, I had chosen to base the Iobarian city that the group found themselves in on the old AD&D module I1, Dwellers of the Forbidden City, also known as the first appearance of yuan-ti. Yuan-ti had a thing for turning people into snake-people, and so I carried that aspect over to the serpentfolk located in the city. And as I was planning on what the snake-god’s little speech would be, I realized that rather than finding it horrifying (or at least unpleasant), Bill would probably be really into it (and he was). Which presented the possibility of an odd situation where the antagonists wanted to kidnap the PCs and subject them to awful rituals to turn them into monstrous snake-people, and one of the PCs would be all for it! Now, as it happened, Orseen dutifully fought by his companions’ side despite his species-dysmorphia and killed the snake-god when the opportunity presented itself. But after beheading the abomination, he made the curious decision to drink its blood, which must have sounded like a really strange decision to make to those reading at home. So there is the missing background information on the warpriest’s odd course of action. Having anticipated that Bill might do something like that, I had given some thought to how it would turn out. Even if conducted correctly, the transformation process isn’t guaranteed – the degenerate snake people in the sewers attested to the possibility of it going wrong. I imagine that many subjects simply do not survive the process at all. So at the very least, some Fortitude saves were probably in order. Orseen passed those without a problem. Then I had him collapse so I could have time to think about what to do next. By the time the group had gone through the treasure and returned to Stagfell, I decided that the nature of the act – drinking a serpentfolk abomination’s blood to try and turn into a serpentfolk – was kinda crazy to begin with. In the end, I let his fate fall to dice – get a high (at least 15) result on a Constitution check, and maybe it would kinda sorta work. Bill rolled… poorly. Orseen shuffled off this mortal coil. Hey, said Bill, that was no problem! It was another shot at the reincarnation roulette wheel! Which would cost another 3,000 gp (1k for the spell, 2k to get rid of the permanent negative levels), which Aakif the arcanist insisted should come out of Orseen’s share of the treasure. A reasonable demand, given that he had died doing something rather dumb and completely voluntary. 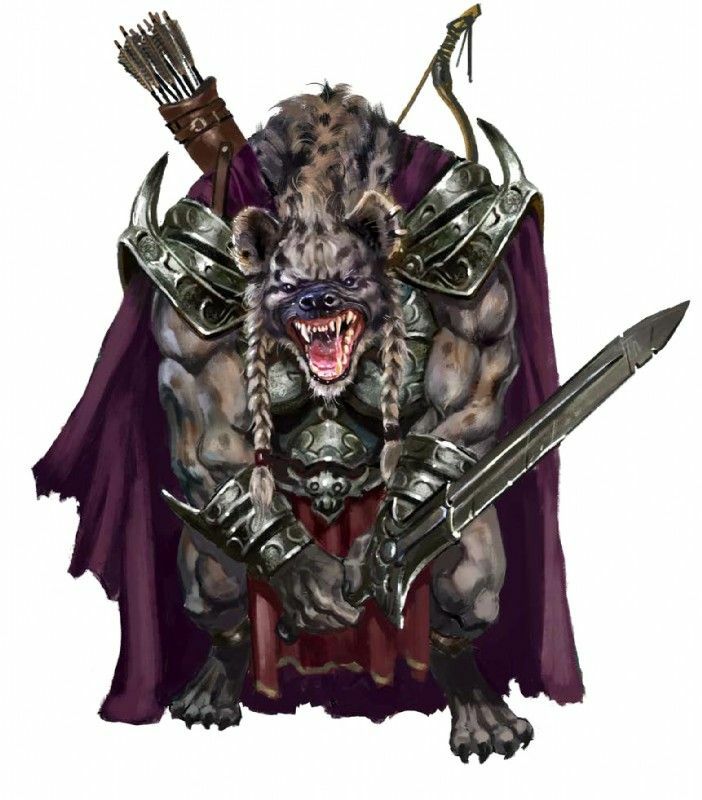 Bill rolled the percentile, and came up with – gnoll! As it turned out, this was a pretty good result! Going from human to orc had netted him a +2 increase to Strength and darkvision, albeit at the cost of being sensitive to light. Going from orc to gnoll gave him a +2 increase to Constitution, kept the darkvision, and removed the light sensitivity. Every time Orseen got reincarnated, he traded up! Furthermore, while gnolls are not reptilian, they are apparently sufficiently monstrous enough that Bill said he felt satisfied. He would no longer strive to play a lizard person. A Good Day to Rest Hard? Getting back to Caerelia and the main plot, the party divvied up the Iobarian loot and discussed what to do with the magical morningstar that they had found. It was +3 with the disruption and undead bane special abilities, and was worth around 72,000 gp. Remesio the cleric didn’t want it – he had a +2 rapier and Weapon Finesse, and didn’t really hit things anyway. Aakif and Satampra the swashbuckler wanted to sell it and use the gold to make magic items. Orseen argued that it should go in Stagfell’s museum for the Loyalty bonus, which was sorely needed now that one of their major cities had been wiped out in an incursion from the First World. The others went along with the idea – they could certainly use the bonus now, and could always sell the weapon later. Speaking of the incursion, while the wild fungal growth that had overtaken their territory had stopped expanding, it was slow in dying off. The Caerelian ruling council decided that they would reclaim that land and re-establish a city on the site of Salar’s Rest, though doing so would surely require a lot of effort – and BP! And they would call the new city… Salar’s Rest II – Rest Harder! Or, maybe not. Next: pulled back from the brink! Good thing you’d thought about the Snake Person thing beforehand. I’d have been stumped I think. And a Fire Elemental for a pet is… fairly tame in pathfinder, I think? A familiar and then Improved Familiar, maybe? Well, he’d have to be an arcane caster instead of divine for that, right? I was thinking of just giving him one as his “battle companion” from his warpiest blessing, which pulls from the summon monster lists. By the rules he could only pick a lawful outsider, but whatever, it’s already a fairly weak pet. I _think_ you can get a familiar via Feats, but no promisses. And yeah, I’d let him have it too, Elementals aren’t the most powerful familiars anyway. Maybe it’s a divine servant elemental, there’s precedence, gozreh’s avatar is a storm elemental, I could see sarenrae or somesuch having good/lawful flame elementals.